As the Marvel movie universe expands, they're actually looking smaller. Ant-Man may not be the biggest comic hero, both in size and popularity, but he's joining the ranks. And with that comes collectibles and merchandise. 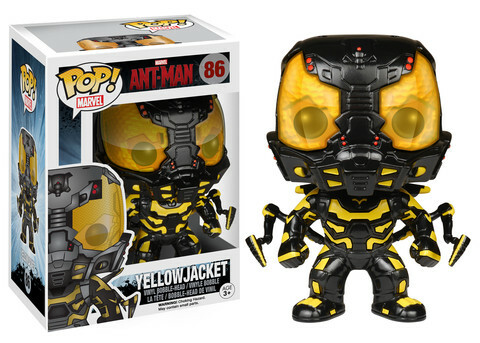 The 2015 Funko Pop Marvel Ant-Man vinyl bobbleheads cover both the titular hero and the movie's central villain, Yellowjacket. Both figures, which are numbered to the Pop! Marvel line, stand approximately 3 3/4-inches tall. They showcase both characters in their costumes. Ant-Man is a mix of red, black and silver. Yellowjacket is yellow and black, looking kind of like the Michael Bay version of Bumblebee cross-pollinated with the movie version of Bane. 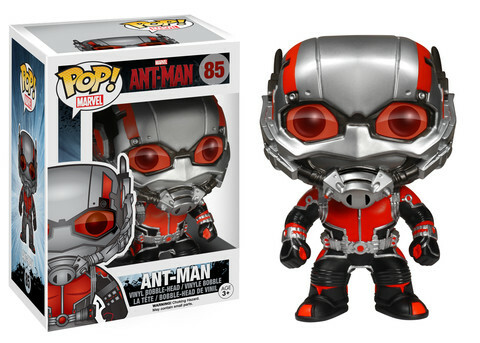 Each of the 2015 Funko Pop Marvel Ant-Man figures is sold separately. Ant-Man arrives surrounded in a bit of controversy. After spending years developing the film, director Edgar Wright dropped out at the last second and was replaced by Peyton Reed whose biggest film to date came in 2000 with Bring It On. Paul Rudd stars as Ant-Man. The cast also includes Michael Douglas, Evangeline Lilly and Corey Stoll.